Have you ever considered booking a trip to Israel? If it is not already on your list of vacation destinations, it really should be! The country is full of rich history, food, and people, and there are tons of great ways to spend your time. We certainly think everybody should see it at least once, which is why we are proud to help people plan their trips to Israel in a way that is fun, convenient, and memorable to their tastes. For setting up trips to Israel, we are the people to call. In the mean time, enjoy these fun facts about our country to pique your interest. Israel has an extremely diverse geography for you to enjoy, with snow capped mountains in the north, desert in the south, and the Mediterranean sea to the northwest. Here are some fun geography facts about Israel. In the 21st century, only two countries in the entire world had a net gain in their number of trees. Israel was one of those two. Israel boasts one of the smallest subway systems in the world in Haifa, which sports only four carriages and a 1.8 kilometer track. The country also houses the lowest freshwater lake in the world, which also happens to be the country’s largest: the Sea of Galilee. Though it is a freshwater lake, all Old and New testament writers referred to it by the Hebrew word for “sea” except for Luke. The dead sea has such a high concentration of salt, that if you got into it, you would float. In fact, it is almost not possible to dive under its waters. Additionally, it also happens to be the lowest place on earth. A cemetery in Jerusalem, Mount of Olives, is the world’s oldest cemetery that has been used continuously throughout its past. The country of Israel not only has a rich history, but a bustling present and bright future as well. Check out some fun facts about things going on in the country today, as well as fun facts from the past. Israel’s city of Beersheba, located in the Negev desert in the southern half of the country, has the highest per capita number of chess grandmasters in the entire world. According to the Guinness Book of World Records, the largest pepper ever grown is from Moshav Ein Yahav, and was grown in the year 2013. Israel has an extremely rich history, and it is being preserved very well in all of its many museums. In fact, Israel has more museums than any other country in the world. People in Israel must love to read, evidenced by the fact that it buys the second highest amount of new books per capita in the world. Israel scored extremely high on both average lifespan and overall well being on the Better Life Index. 82 years is the average, a full two years above the OECD average. We all know Silicon Valley is a technology powerhouse, but did you know that Israel has the highest concentration of tech companies of any country in the world? There are more than 3,000 tech companies and startups operating right now. About 75.4 percent of people in Israel identify as Jewish, with Arabs being the next largest group at 20.6 percent. In Jewish tradition, all food eaten must be kosher. What this means for a predominantly Jewish country is that you can find kosher anything in Israel, including McDonald’s and stamps. Unlike in the United States, where two major parties dominate the political landscape, Israel had 34 different political parties participate in their 2013 elections. There are not one, but two official languages for the country of Israel: Hebrew and Arabic. 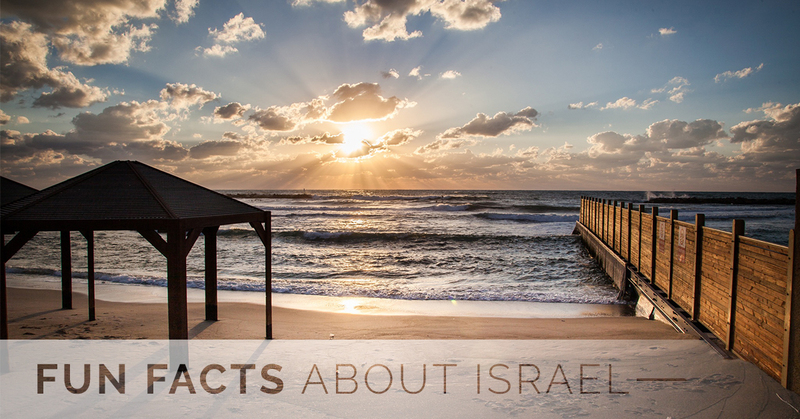 We hope you enjoyed these fun facts about Israel, but they barely scratch the surface of all the interesting things going on here. To experience all this country has to offer, you will just have to come see it yourself. For those of you who are looking to book trips to Israel, World Express Travel would be happy to offer our services. We will help you out every step of the way to ensure that you get a trip tailored to everything that you want to do and experience. For more information, please do not hesitate to give us a call today.